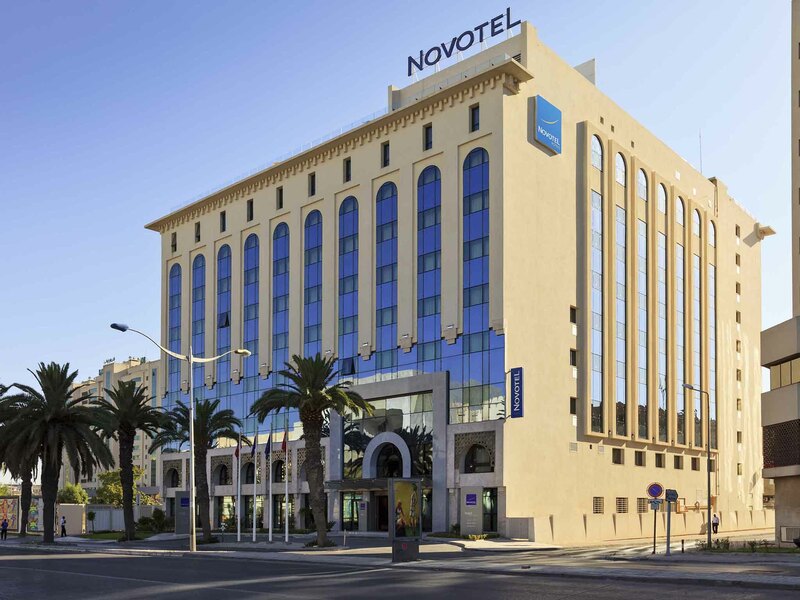 In the heart of the city's business district, stay in one of our comfortable rooms at the 4-star Novotel Tunis hotel. The hotel is less than 15 minutes by car from the Medina and its historic monuments. Enjoy a visit full of discovery then sit back and relax by the pool on our roof terrace. We have 14 rooms for meetings and conferences. In the evenings, let yourself be tempted by the restaurant's original, modern cuisine. Get a taste for the Tunisian way of life at Novotel. With a contemporary and completely modular design, Novotel's spacious rooms are real living spaces and can be adapted to suit all requirements.Unique services. The Executive Room offers VIP treatment, with a minibar, Internet, a flat-screen TV, late check-out until 4pm, free national phone calls, a Nespresso machine, a wide range of complimentary items, slippers and a bathrobe. Choose comfort and space. A spacious room with a king-size bed, bathtub or shower, sofa bed, desk, TV with films on demand, high-speed Internet access, hairdryer, safe and tea and coffee making facilities. Up to 2 adults and 2 children. All our Superior Rooms feature added products and services: coffee machine, iPod docking station, extra bathroom products, bathrobes and slippers, bottle of water, Internet access and complimentary local calls. Up to 2 adults and 2 children. In this pleasant, comfortable bar, you can relax, enjoy a light meal or sample our selection of cocktails and homemade cakes and pastries. Not the best , but was good in general . The rooms were little bit warmer than should be at this time of the year , I barely was able to sleep .. The buffet was not various at breakfast neither at lunch . Thank you for the upgrade. Your hotel is nice, clean, the staff very friendly and professional, the food in the restaurant and room service excellent, I like your spa area upstairs and the rooftop terrace. Your room service lady was friendly but not so friendly, but it`s alright. I would like to see on the television programme also one or two German-language channels and also NHK World please. I would also like to see some more serious efforts from your side to become environmentally friendly, for example get rid of plastic bottles and use only glass bottles. Also for the shampoo or soap dispensers you should use large containers instead of the little small ones. Wish air conditioner got a little colder. Had to sleep with window open to keep from getting stuffy. Very satisfying. Staff excellent. Rooms very good and location excellent. Worm welcome by the receptionist Semah and the smile on every staff member including security guards. Also, getting to meet the Hotel manager Mohammed Trabelsi who remembered my last visit which was few months ago. The rooms were good and practical. I’d suggest that you upgrade the shower heads to bigger one. And remove the bath top they are on the way of being practical. The room was not very clean , and it felt a little cheap , only one towel available. The breakfast buffet was extremely poor . THe room also didnt have a safe to put valuables. The hotel was exactly what I wanted, bright, clean, smoke-free with great service and food. As always it's lovely to stay at the hotel, where staff are friendly and helpful. It's also nice that staff remember you and welcome you so warmly. I'd also extend my compliments to the chef as I look forward to my gluten free pasta with arrabiata sauce and the chocolate fondant - yummy! Pity breakfast is a bit limited for anyone who is gluten free and vegetarian. My sleep on the first night was also interrupted by some drilling noises (not the hotel's fault) but I was grateful it wasn't repeated the second night I was there. Thank you to all the staff for making my stay an enjoyable one. The room is nice and clean. The staff is courteous and friendly and the whole atmosphere is nice. The hotel has a fantastic staff at all level and it makes life easier. Food and room are good and everybody is trying to help you. This is my base in Tunis. Key crosspoint between Airport, Motorway and City, very easy to reach as well as to start from to reach any point. All excellent services availabe (wiFi, restaurant, wellness, fitness room, etc...). Friendly personnel, easy checkin/out, wonderful quality of sleeping, quiet location. Rooms were very hot with no AC, so did not sleep very well at all to be honest. The staff were exceptionally professional and kind and I was allowed to extend due to my late arrival and departure flights the next day. Just excellent, as usual. Comfortable crosspoint between Airport, Motorway and City of Tunis. High level of services, warm wellcome, friendly personnel... All you need for a stop during your business and not only. As always the staff at the Novotel Tunis are most welcoming and are genuinely very friendly. The breakfast staff are so cheerful even when very busy. Chef Marwa makes the best omelettes and the breakfast pastries are second to none, so fresh and delicious. SERVICE IS GOOD , FOOD GOOD JUST NEED TO VARIETY THE MAIN DISHES FOR LUNCH AND DINNER THE PEOPLE THEY ARE WELCOMING. Rooms are too small and no frills whatsoever. In my opinion, the rooms are more of a 3-star hotel at best. The USB socket did not work and because I did not have an adapter I could not charge my phone. The room was too hot and there was no way to control the temperature. The bed is uncomfortable. On the other side, the staff were great and helpful. The breakfast is excellent. I do not think I would choose Novotel Tunis again because of the room size and condition.